Showering has never been so fun. Moxie lets you stream your favorite music, news or talk radio right in the shower with you. The Moxie showerhead holds a portable speaker that pairs wirelessly with devices enabled with BLUETOOTH(R) technology to deliver high-quality audio to your shower. The speaker docks directly into the showerhead, so your music is closer than ever when showering. While it plays your favorite sounds, this revolutionary showerhead generates a full-coverage, revitalizing spray of water for a sensory experience like no other. Moxie is easy to install and use; the wireless speaker pops out for recharging, then securely pops back in for use while showering. You can even take it with you as a wireless speaker to use in any room of the house, or on the go. This handy showerhead from Delta gives you a deep-down clean from head to toe when you use it. Your showering will be even better because of the 2-in-1 design of this product. Measuring 3.35-inch D, 11.24-inch H, and 6.76-inch W, this showerhead offers gives you plenty of water and takes up little room. The perfect blend of luxury and all-around use, this showerhead hand shower combo from Delta gives an amazing clean. Your showering will be even better because of the 2-in-1 design of this product. With a 5.81-inch D, 10.13-inch H, and 6.13-inch W size, this showerhead is small enough to fit into smaller spaces and gives plenty of water. From the experts at Delta, this top-grade showerhead brings you a great clean from head to toe. Thanks to its 2-in-1 design, you'll enjoy a faster, all-over clean with every shower. With a 4.50-inch D, 6-inch H, and 6-inch W size, this showerhead takes up little space while giving you plenty of water. Moxie 2.5 Gpm Single-Function Showerhead With Wireless Speaker, Polished Chrome Showering has never been so fun. Moxie lets you stream your favorite music, news or talk radio right in the shower with you. The Moxie showerhead holds a portable speaker that pairs wirelessly with devices enabled with BLUETOOTH(R) technology to deliver high-quality audio to your shower. 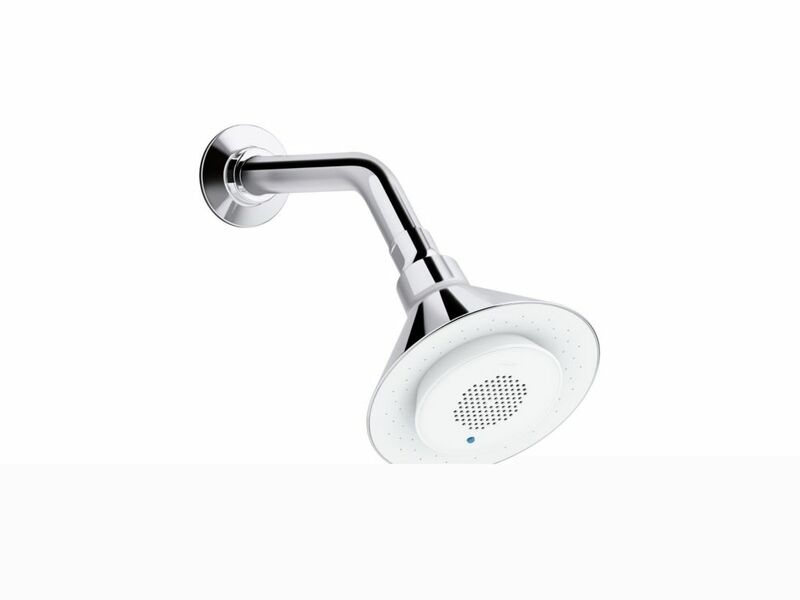 The speaker docks directly into the showerhead, so your music is closer than ever when showering. While it plays your favorite sounds, this revolutionary showerhead generates a full-coverage, revitalizing spray of water for a sensory experience like no other. Moxie is easy to install and use; the wireless speaker pops out for recharging, then securely pops back in for use while showering. You can even take it with you as a wireless speaker to use in any room of the house, or on the go. Moxie 2.5 Gpm Single-Function Showerhead With Wireless Speaker, Polished Chrome is rated 4.3 out of 5 by 33. Rated 3 out of 5 by John from Great but fell apart Enjoyed this showerhead/speaker for approx. 4yrs before the white face (not the speaker but the large shower face) has started to pull away from the metal frame. Water is now leaking/spraying behind the shower face. Expected it to last longer at this price. Rated 4 out of 5 by Andrea from It would be nicer if the battery would last longer... It would be nicer if the battery would last longer and if the speaker would be louder. Rated 2 out of 5 by Ramonmartinez73 from It’s take a long Time to charge, it’s not loud... It’s take a long Time to charge, it’s not loud enough. I hope they improve it. Rated 4 out of 5 by TJ from The install was really easy and the water pressure is... The install was really easy and the water pressure is nice, I just wish the speaker was a bit louder. Overall, I'm happy with the purchase. Rated 5 out of 5 by Alexandra from Easy assembly and so much fun to take a shower!!... Easy assembly and so much fun to take a shower!! Love it. Great pressure too. Rated 5 out of 5 by Fatboy03 from Very nice. great sound. Big shower pattern. Bought a second one to give to my granddaughters. The... Very nice. great sound. Big shower pattern. Bought a second one to give to my granddaughters. They love it. Rated 5 out of 5 by Timboy from Have this connected to my Amazon Echo, best purchase i have made in MANY years...... works fabulo... Have this connected to my Amazon Echo, best purchase i have made in MANY years...... works fabulously!!!!!! Rated 5 out of 5 by Dill from Good sound quality. Very useful and fun.... Good sound quality. Very useful and fun.